Roller Cutters, Sizers, & Levelers - Savage Bros. 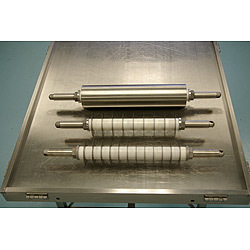 Roll out the batch to the proper thickness with a weighted Rolling Drum Sizer - works like a rolling pin. Or if you have several thicknesses of product, consider the Leveler, a vertical plow with adjustable height. Then cut the batch into precise size pieces with the Roller Cutter. The Table Cutter spans the width of the table for a perfectly straight cut in one pass. Cut across the table with a hand roller cutter. Sizer - weighted drum with easy to hold revolving stainless steel handles. Leveler - Thumbscrew adjustable vertical plate. Hand Roller Cutter - Double beveled stainless steel knives, hardened for long life. Three diameters - 4" for up to 1/4" thick candy; 6" for up to 1"; 7" for thicker product. Table Cutter - Spans entire width of Cooling Table on sturdy 1-1/4" shaft with 7" diameter knives and spacers.